Most Monday's I have a post ready to tell about the weekend, however, once in a while I have other things to say and I post the weekend report on Tuesday. Let's talk about buses and road life for a few minutes today. 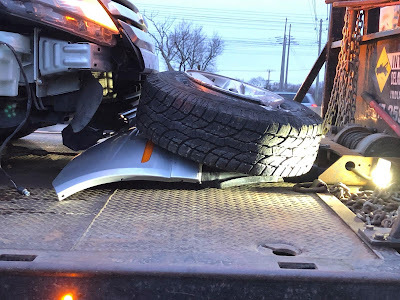 A large tire and wheel came off of a Jeep traveling in the opposite direction. 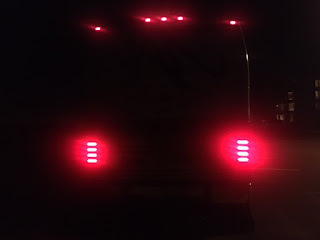 The tire jumped the concrete divider wall and bounced its way down the interstate until it hit the front of their bus. The hardest hit was just below the windshield. 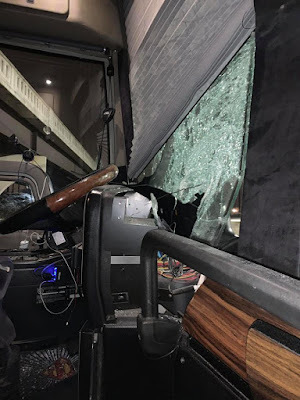 An initial impact a few inches higher and the driver would have probably been instantly killed and the lives of the people on the bus and in the cars surrounding would have been in serious jeopardy. 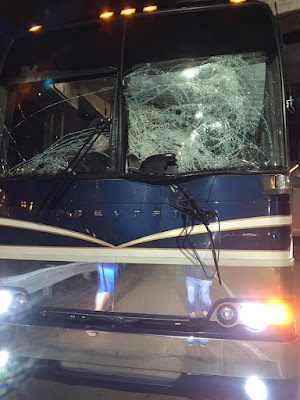 As it was the driver was able to miraculously control the bus and safely bring it to a stop even with glass raining all around him and complete confusion and chaos crashing in as well. The crash was unavoidable for the driver of that bus. The tire was probably in his face faster than a human can react. That is why we must have the help of the Lord. This is a horrible mess, inconvenience and expense for the Perry's, but they are thanking God and we are thanking God for them that it was not much worse. It could have easily been a life ending tragedy. I have also been thanking God for all the people in cars and pickup trucks behind the Perry's bus. Without the bus in front of them to take the hit, some of them would likely have been killed. 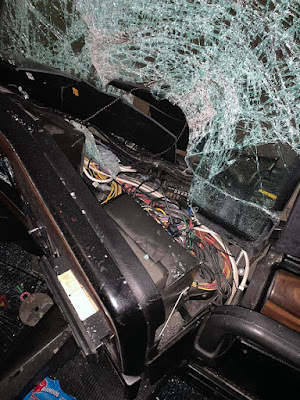 One friend text me and said, "I had to stop and thank God audibly for constantly keeping His hand of protection on you all after reading about the Perry's bus accident." 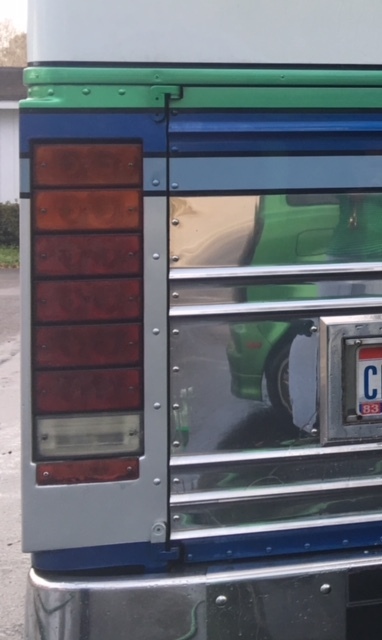 After leaving Easley, South Carolina we had a couple of projects completed on the BoggsMobile in Vonore, Tennessee. It feels like home when we pull into Jeff Rowe's place. They make us feel at home and always take care of us top notch. 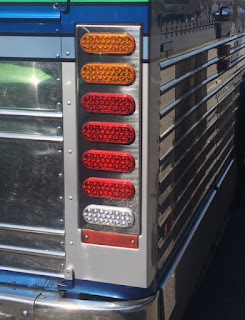 We pulled into Tennessee Luxury Coach on Thursday last week and in a few minutes, they had removed the original tail lights from the bus. I do not have a picture of the originals Thursday, but here they are freshly washed in February. 24 years of use had left them cloudy and downright dingy. I could not get them to clean up properly. That is the main reason for replacement. They were not bright enough at night. When cars and trucks are coming up on me at a high rate of speed, I want them to see me for a while before they get to me. The incandescent bulbs were constantly going out and I could never seem to keep them all working at the same time. It was time for LED. I had asked Jeff about them quite a bit ago, but I could never get by his shop at the right time. This time the stars lined up perfectly. Kelly Jo and I tackled another project while in Vonore. Occasionally, the Jacob Brake (Jake) on the BoggsMobile would stop working. The Jake is an engine exhaust brake that slows the bus considerably and saves the regular brakes a lot of work. It would work perfectly all day and then suddenly nothing. It used to happen very occasionally, like maybe 20 times in 10 years. Since November, it has been much more frequent. It would reset if I turned off the engine and then started the engine again. That told us it was most likely an electrical problem. The wiring harness that was replaced in Houston also energizes the Jake. We figured the problem was solved when that was completed. Nope. The ECM, engine computer, sends the signal through the wiring harness to the Jake. We figured the intermittent Jake problem would be repaired once the ECM was replaced in Alabama. Nope. There was one more thing to check. 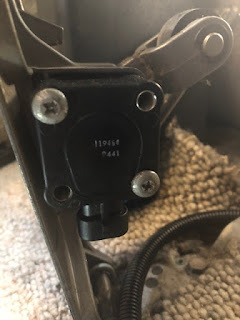 There is a Throttle Position Sensor (TPS) that is mounted to the back of the "gas" pedal. It sends the position of the throttle to the computer. It determines how much fuel you pour into the engine and makes it go faster. It also affects the cruise control and the Jake. The Jake is activated when you take your foot off the gas pedal. On our way to North Carolina a couple weeks ago the Jake quit again. We stopped at a rest area, but did not turn off the bus. Instead, we unplugged the TPS and then plugged it back in. The Jake worked perfectly! BINGO! The TPS is normally easy to replace. Two screws and an electrical plug removes the old one and two screws and an electrical plug installs the new one. Of course, life can not be that easy all the time. They have changed the plug on the replacement TPS so they also sent me a 3-4' wiring harness with the new TPS. You now have to replace the TPS and the wire that plugs into it. That wire is fastened to the pedal and to the floor then goes through the floor and plugs into another harness. This picture is taken looking up from laying on my back directly under the front seat and floor area. 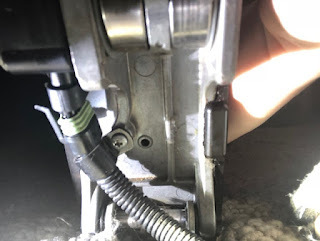 Once we had that wire out, we fished the new wire in, plugged it in below, wire tied it very good below and then fastened the new wire to the floor and pedal. It took a little longer to do it than to describe it, but it was not too bad. AND, so far it works! I am working on another thing or two, but nothing major. Things that need to be completed are just enough to keep us praying. Keep-On praying & all shall go well, simply have faith & trust at the same time & all shall come together for the good, Love-Y'all, Frankie. Thank you for the encouragement, friend. It is always good to hear from you. Kids Free Egg Hunt! Wait What?